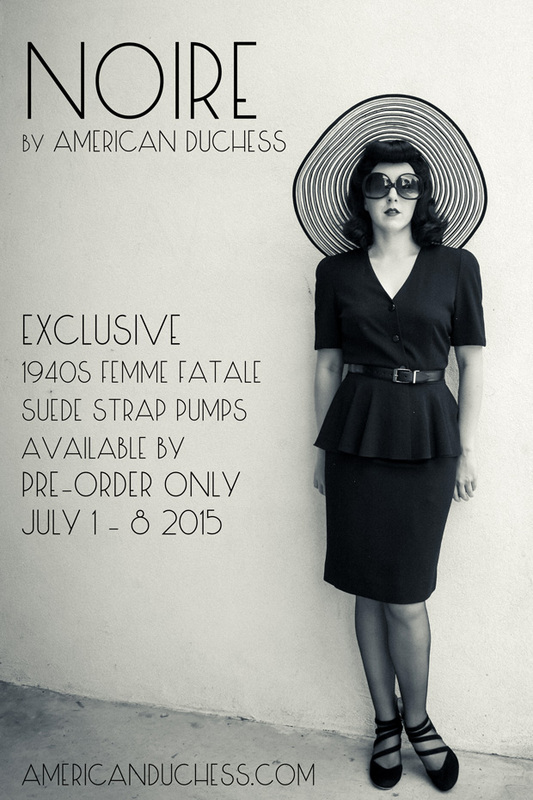 Exclusive "Noire" 1940s Pumps - Pre-Order Open! 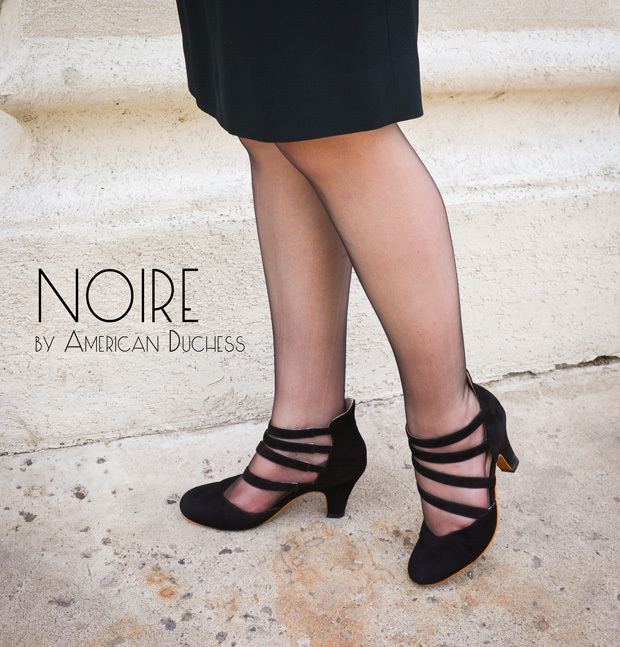 We've finally landed another American Duchess Exclusive, a design submitted and voted for by you! 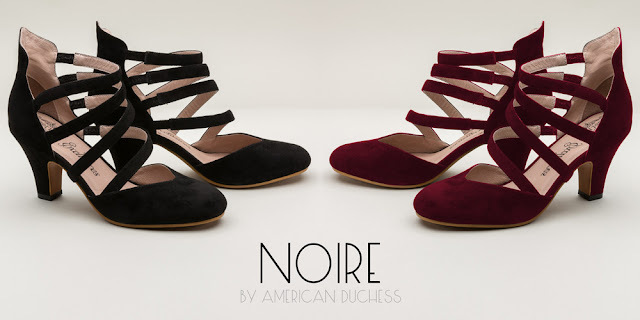 Meet "Noire," our vampish 1940s quad-strapped heels in black or burgundy suede. If these beauties were a movie star, they'd be Joan Crawford. The original shoes were sold by FabGabs Vintage, and can be seen here. And the extra fun part - they're an Exclusive, which means Noire are ONLY available by pre-order. We only make as many pairs as are ordered between now and July 8. We will NOT have these in stock, and we will NOT make them again, so don't wait! ...But don't be afraid! "Noire" qualifies for EasyPay Layaway on AmericanDuchess.com. You can return them for a full refund or exchange them if they don't fit (exchanges require additional manufacturing time for us to make you a new pair). If these strappy belles are for you, head on over to the "Exclusives" section at AmericanDuchess.com and order yours! If these strappy belles are not your style, send us a picture of your favorite dream-come-true historic shoes and if we can make 'em, we'll include them in the next Exclusive vote on Facebook. Oh these are just unbelievably gorgeous on you, with that dress and hat! WHERE did you get the hat? I will have to really dig, now, to send you my fave pumps of the period -- 1939 fire engine red sweetheart things. I got to wear them in All My Sons years and years ago, with a cute little flowered sundress they made from a vintage pattern. I felt like my mom, who was in her 20s back then! Thank you! I got the hat at Dillards a couple years ago. It's just ridiculously huge, I couldn't pass it up! Oh I'm definitely sold. I'm already planning ahead for 2016's Noir City festival ,and I will be wearing these lovelies.